Where to begin? 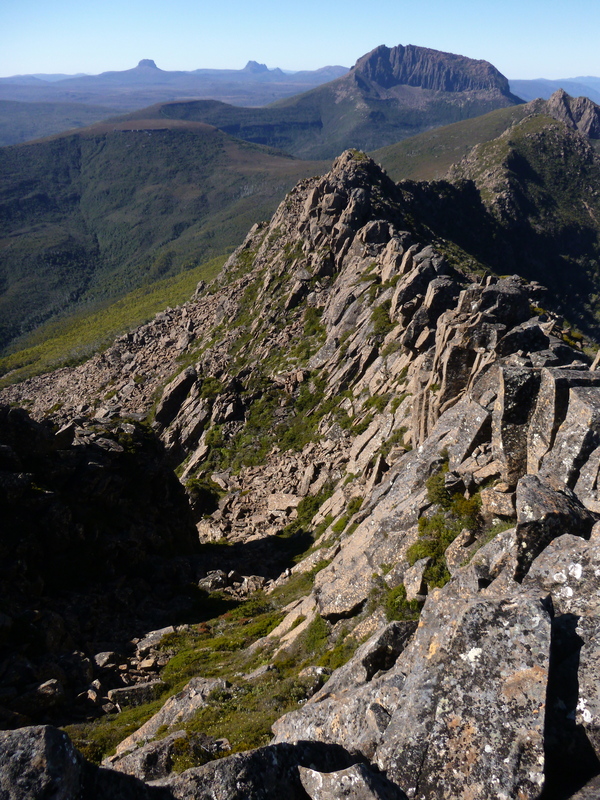 The start perhaps… Some months ago, one of the Pandani organisers of medium-hard walks, Murph, sent out a feeler email asking who would be interested in going to Perrins Bluff in January. Anyone who really knows me knows that that kind of question is largely rhetorical. I’m always interested, it’s just a matter of making sure a walk doesn’t clash with a walk I’ve already committed to, and that I can get the time off work. I was slightly startled to learn on the last day of the trip as we said our goodbyes and thank yous that I was the only one of those initially asked to have answered with a yes, and had I not, the trip might not have got off the ground! Perrins was one of those mountains I’d heard of, even had maps to, and had a tentative 3 day trip idea to get in and out, doing basically what we ended up doing. But I hadn’t been in at all, had little idea of the terrain or how route finding would be, no GPS route to back me up just in case the weather caved in, and as a result it had stayed a short way down my list of 3 day walks. So I was very interested in going in with Pandani. 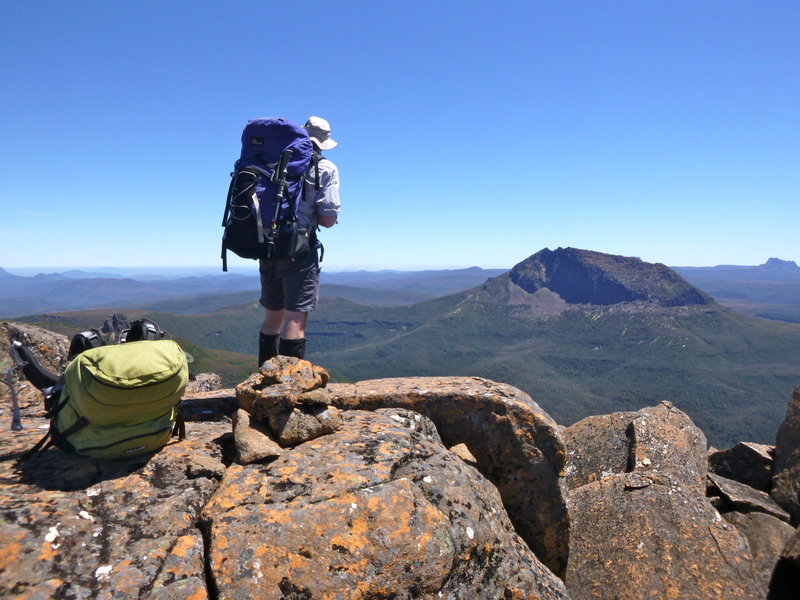 The only part that made me hesitant was that the trip was 4 days and was focused largely on Perrins Bluff (a similar trip two years ago or so had the Pandani group turn around close to the summit, about 150 m!). I’m rather greedy when it comes to mountains, and I really wanted to be able to do more, though I understood entirely that with a larger group the going is naturally slower, and as a result the planned itinerary was appropriate. 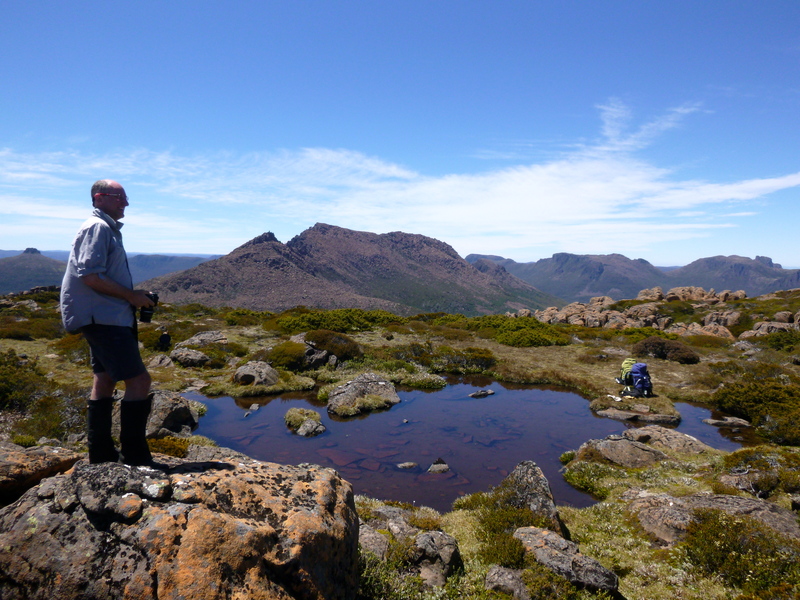 But when a good friend, Graham, who walks at a very similar pace, pauses to enjoy and examine similar things (views, birds, flowers, orchids.. scats even! ), and understands the need to take photos frequently, suggested a walk in over Paddy’s Nut and Thetis, and meet the group for Achilles and Perrins Bluff, my excitement levels went off the scale. As the weekend approached, anticipation sky rocketed. The weather was forecast to be perfect (slightly on the hotter side of warm, but not at all wet or too windy). This was fine turn around from the weekend before that had actually seen me cancel a walk (I don’t do that lightly), and pay attention to the garden and housework instead (yes, that’s the truth!). 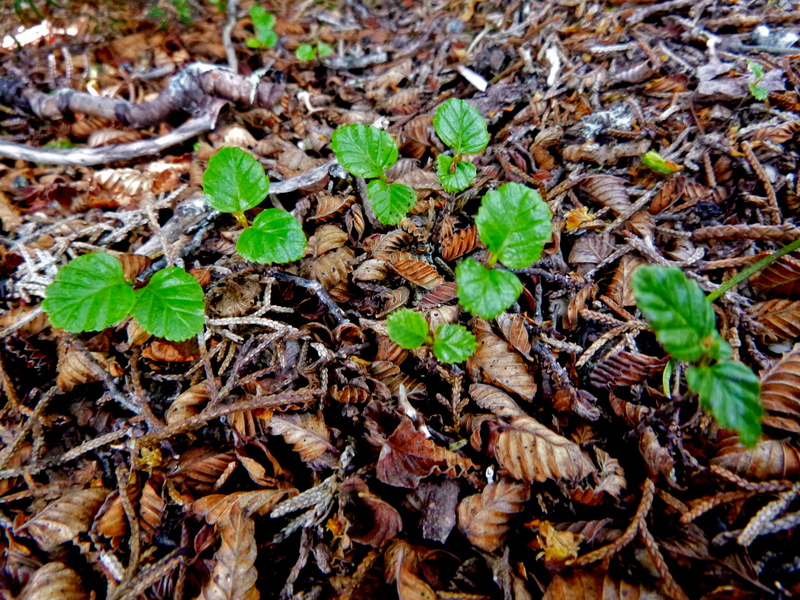 There’s always unknowns on walks, and we had plenty (we hadn’t even worked out where we’d camp the first night! Or just how we’d rendezvous with the others..), but there was something that just said it would be a wonderful trip however it unfolded. And it was, with the usual unexpected delights that come with each mountain climbed, each day lived. I surprised myself with a solid 5 hours sleep on the Friday before starting work at 9pm. It was a very hot muggy night at the bakery though, and come 2 or 3am after an intense few hours on the ovens trying to keep up with dough that was moving much faster than average, I hit a wall. Come 5am I was exhausted, but still very excited, if a tad more anxious as to how I’d fare on the uphills and in the heat. The other six in the group had left earlier, with Graham kindly offering to stay back, drive and walk in with me. I’m always grateful for this, as I don’t like to keep a group waiting for me to finish work, but also know how tiring a long drive can be after an 8 hour shift, so a lift up was appreciated more than usual, especially as it required Graham to move faster than he would have been if he’d been with the group (I really don’t think he had a problem with that though!). So after a quick duck home for a much needed shower to remove the layers of flour and grit, which I would later replace with more grit and scrub and oily sunscreen, Graham arrived and we were off. We made good time on the drive and arrived at the car park just after 9.30, having navigated the Maggs Spur road due to the usual approach to the Arm River track being out of action (bridge down). And it was quite a nice road actually! A lap to figure out where to park, boots on, last minute adjustments, then a few minutes before 10 we start our walk. 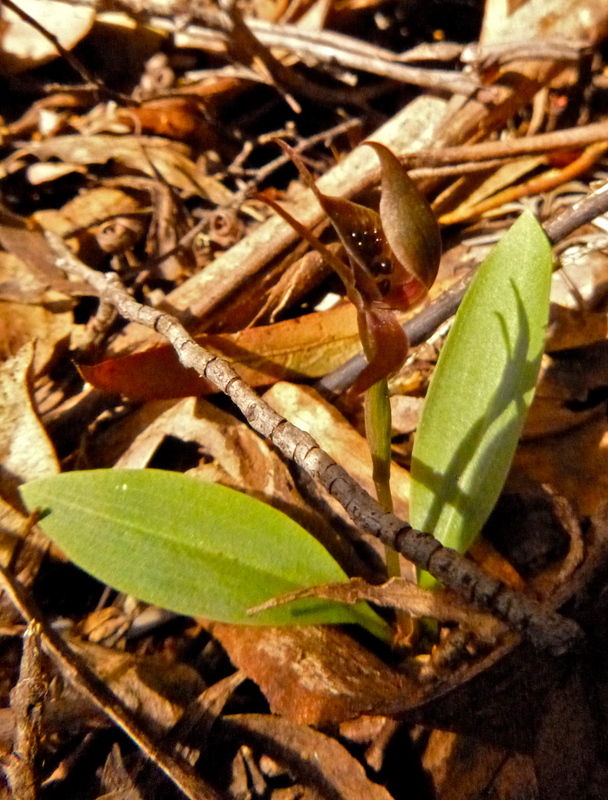 The pace was on the faster side of moderate, with occasional pauses to examine bird orchid leaves in the hope of finding one in flower. Graham spotted all the ones we saw, I just saw leaves. I was having trouble settling into a rhythm, feeling just a little off the pace, but it didn’t matter, because then the up started and I was really off pace! Everything narrowed, and the world was purely about the next footstep, the next breath, the next parched swallow.. a sign I’m walking faster than usual. But it was over quite fast, and though the general gradient was still up for a bit, it was much more manageable. Within the hour we had caught up to the others, and I got a little bit of a rest. We walked together, meeting new people in some cases, catching up with others we hadn’t seen for a while. 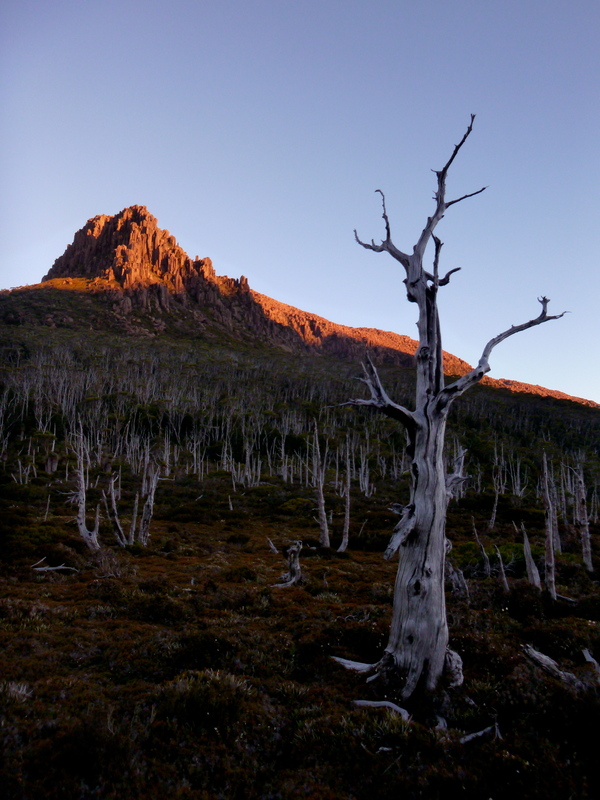 I was a bit preoccupied, my mind was on the significant distance we had to cover after we left the Overland track, and though I knew we had plenty of time, there are times I like to make sure we do. 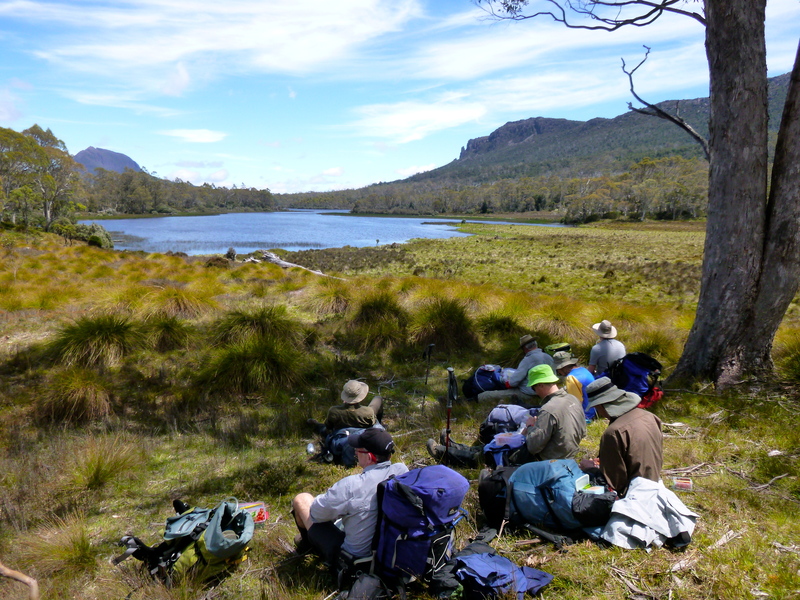 Graham must have felt something similar, and after a shared lunch with the group at Lake Ayr, during which we talked about walks and teased one another over who had the fanciest kabana or pastrami, we consulted with Murph and walked on ahead. I was occasionally tested on bird calls, and failed every one, though I can confidently say there’s a wattle bird currently doing its ‘vomit’ imitation somewhere outside my window! Oh, and now a couple of kookaburras are chiming in :D! A brief stop at the river by the Oakleigh turn off, to top up water and briefly check out the fossils, mandatory bounce on the suspension bridge (why else would they make them?! The 1 person at a time rule begins to make sense, you could easily get into bouncing wars like on a trampoline I’m sure), and onwards we walk. 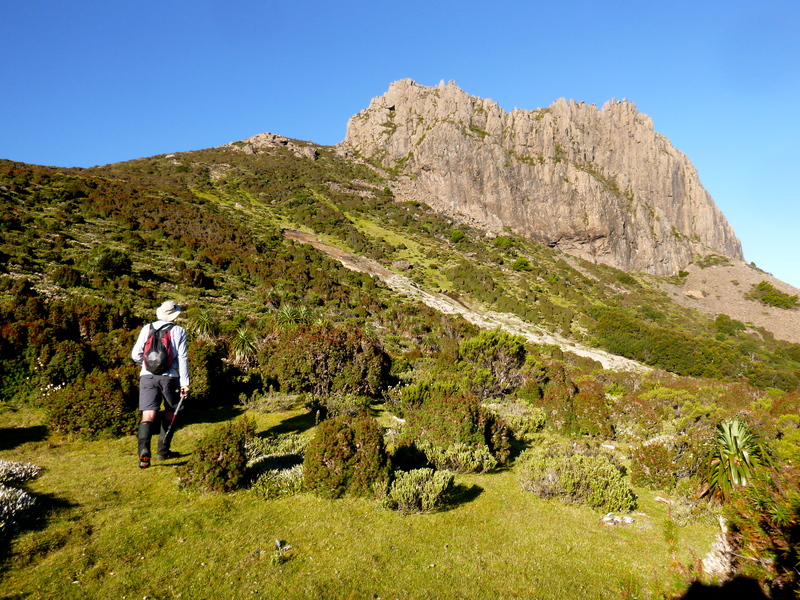 Going the ‘wrong way’ up the Overland track gave us the usual one or two confused looks, but it wasn’t too busy, and we didn’t have far to go. 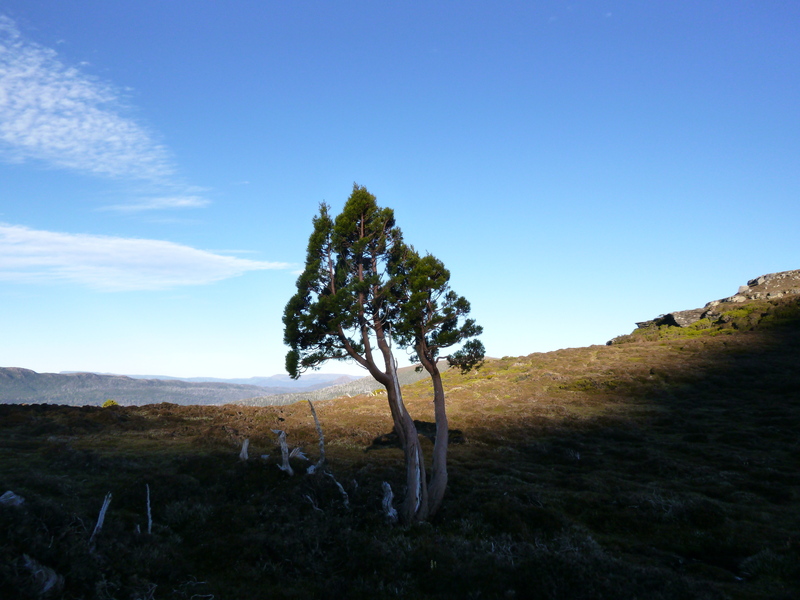 Finding our tree was easy, with a waypoint, gps route and a photo to guide us. The marks on the tree are small, but if you’re looking it’s quite obvious. And so we took to the light scrub. The pad was marked with a variety of different markers, from tape to tin, blaze to plastic bands. In parts it was difficult to stay on, even with a gps route, but easy enough to regain. As we got higher, it got easier, and then it got delightful as the mountains started to appear. 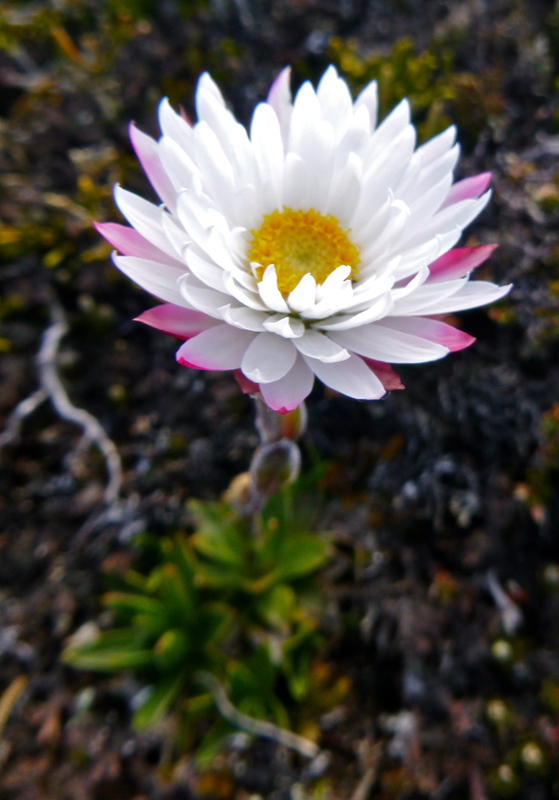 Even the scoparia was more colourful, the pinks adding splashes of colour to what had been whites and slightly off whites/yellows. 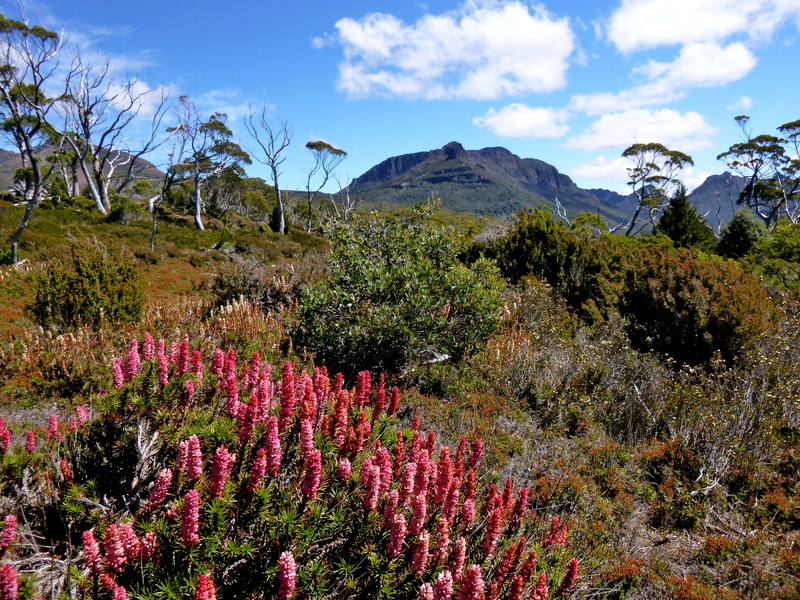 The lemon scented boronia was plentiful, a pleasant assault on our olfactory senses, which had been dulled to deal with the usual mix of sweat and sunscreen. My shirt, at least, was completely soaked. But now that we could see, the pace slowed dramatically as we excitedly rejoiced in each new discovery of a mountain – just like big kids – admired the trees in all their elegance, and took in the gardens and path ahead. 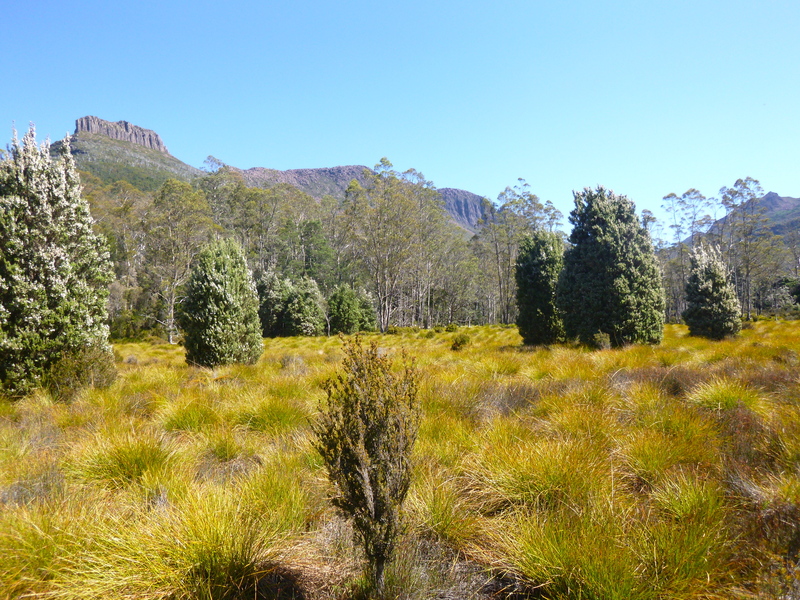 The pad was very easy to follow now, over a flatter section, through bands of scoparia and heath, until we came to the final climb to get onto the saddle between Ossa and Paddys Nut. We decided only here on the climb, as we checked out the old coal mine that the track goes right past (yes, we both brought back a sample, and I’m amazed at how light it is! 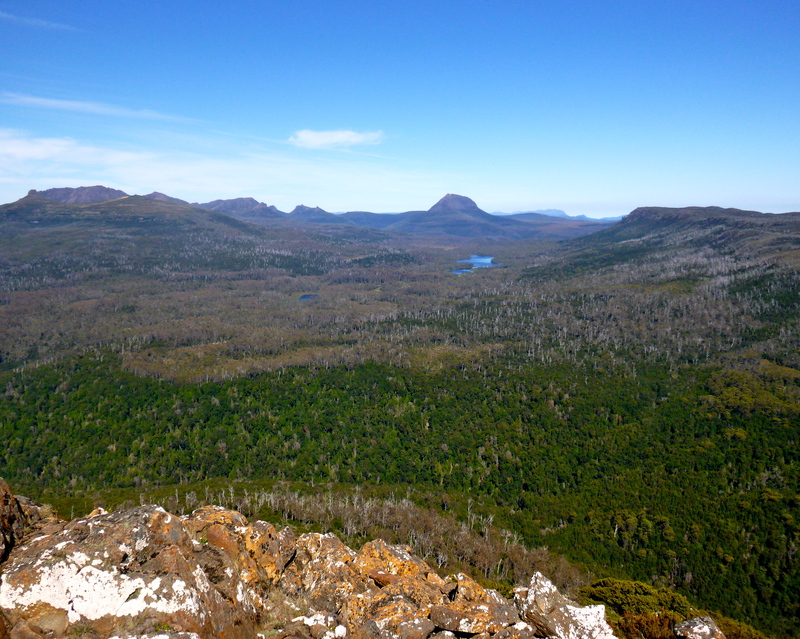 ), that we’d camp at the recommended spot between Ossa and Paddys Nut, rather than push on to the top of Thetis. As much as I relish the idea of camping on summits, we had no reliable information about availability of water, or how sheltered the spot was, and the wind was steady enough for us to want something with shelter. I was also aware I was becoming clumsy, and I didn’t relish more climbing with a full pack on that night. Heading up through a bit of enclosed stuff, we then popped out near the top, amongst yet another delightful garden. Beautiful manicured grass (wish my grass was like that! 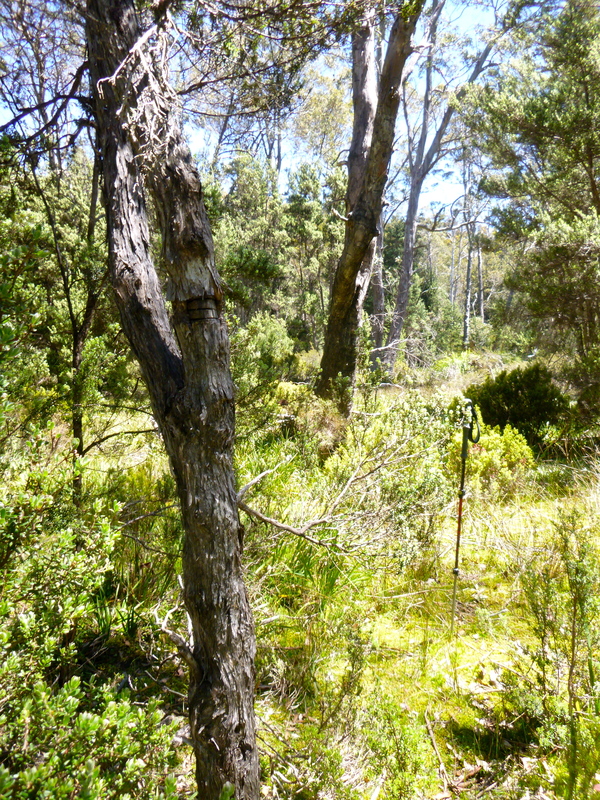 ), clumps of scoparia and other plants, and small pine trees made for delightful walking up the final short sharp pinch. And then there we were. More smiles, a laugh or two, deep breaths as if to breath in the beauty of the place and the mountains around us, and off we went doing our own exploring of the sandstone rocks, the rounded holes that wind and water had worn into the flatter rocks, the cool and refreshing tarns, and of course, taking in the 360 degree views. The photographers in us were well indulged before we decided to find a spot to call home for the night. And what a beautiful little spot this site has to offer. 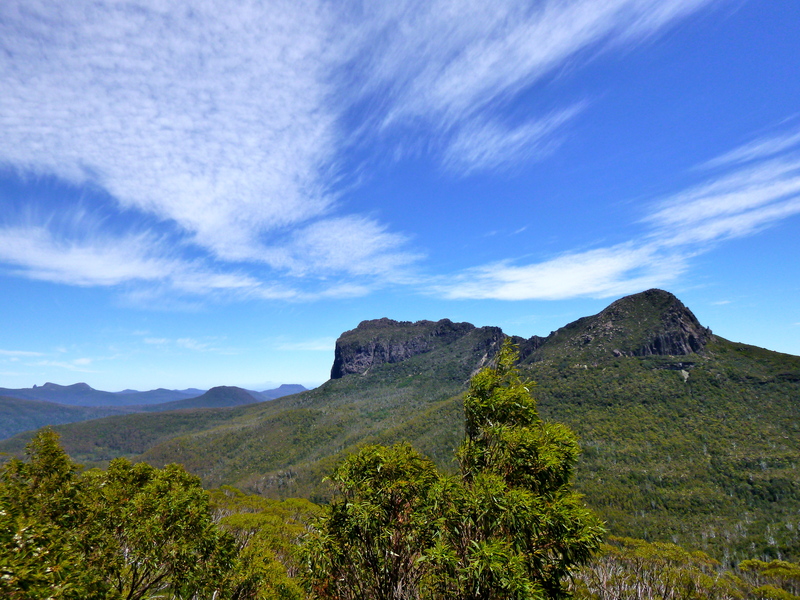 Nestled in the pines, there was no hint of the wind that had seen us don jackets for protection, and we had a stunning view out to Oakleigh, Pelion East and Ossa, and Paddy’s Nut looked over us from above. Sunset on Paddy’s Nut, can you spot Graham’s shadow doing star jumps? 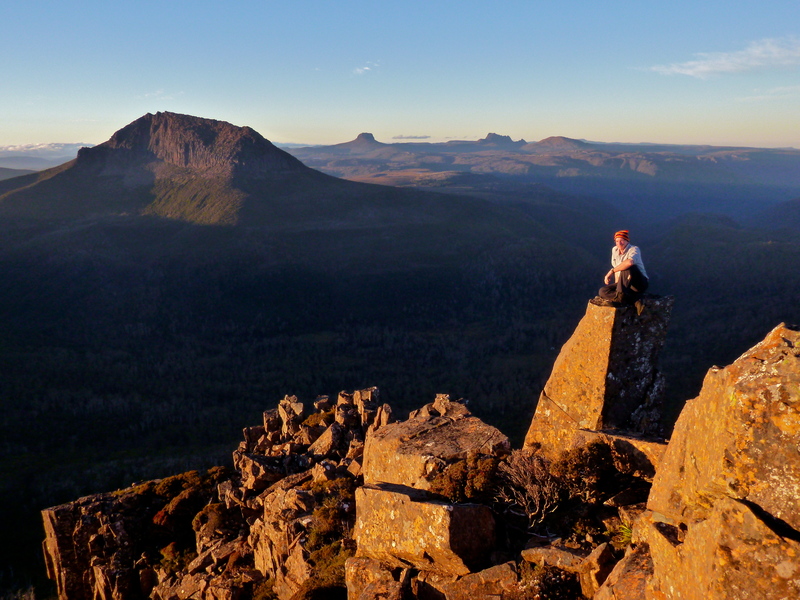 Tent up, gear sorted, and we decided we had time for dinner then a wander up Paddy’s nut for sunset. We got the timing right this time, and popped up after a short 20 min really nice scramble up rock. It was 8pm. This gave us plenty of time to drink in the views, explore the summit, check a second possible high point, laugh at our shadows doing star jumps, climb a rock column that beckoned, holler and wave at what we thought were the tents of our group below at Frog Flats (turned out to be track workers! ), then settle down to enjoy the last kiss of sun on skin as it dipped behind the mountains, and watch the sky and clouds glow their oranges, pinks and blues, the moon becoming brighter as the daylight faded. 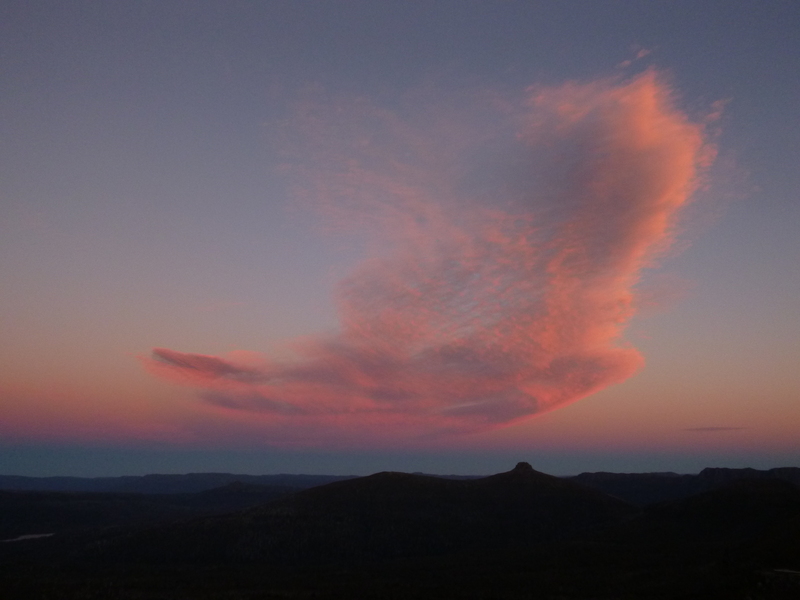 A cloud formation above Pelion East came to life, a soft pink dove, spreading peace across the mountains and all those who were on them. Back to the tent in fading light, but no need for head torches, and time to crash. In the mountains again, I get a deep night’s sleep. So much so, in fact, that the following morning it’s 10.20 before we’re packed and ready to head off, and though Graham will laugh about his reputation for always being the last ready, I wouldn’t have been ready much earlier! We wandered up over rock, and sidled round the side of Paddy’s Nut, no need to gain height we’d just have to lose. At the saddle between Paddy’s Nut and Thetis we decided it wasn’t an ideal place to camp (it had initially been one of our considerations, but had been scratched relatively early on). 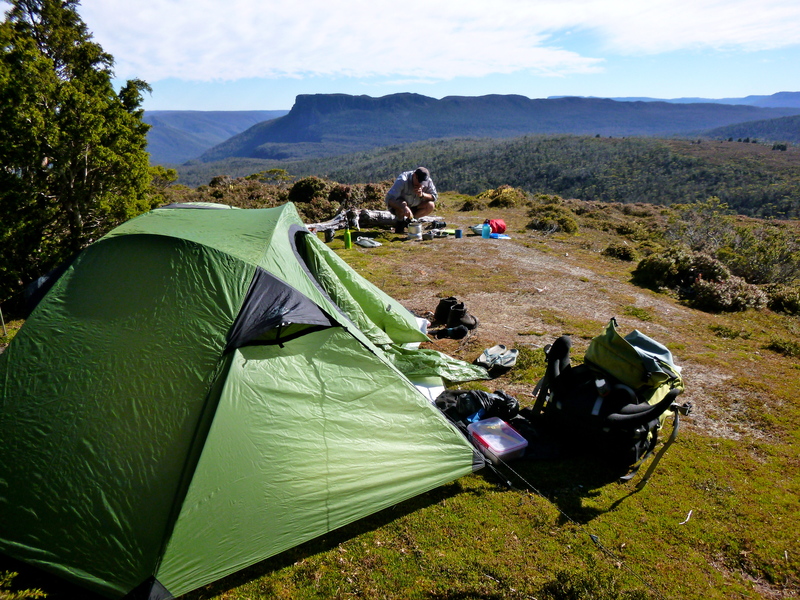 Paddys Nut saddle camp the next morning.. lovely views! A slip on rock and a decent dent on my shin woke me up, and I decided it was probably wise to pay at least as much attention to my feet as the view. The problem was the clouds had been making such nice patterns and even though I haven’t mastered the art of rock hopping with my eyes on the sky I seem to forget that from time to time! But the climb up Thetis was fun, even more so because we didn’t necessarily go the ‘easiest’ way, something I quite like about walking with Graham. I don’t know what it is about scree and boulder hopping, but even when you’re exhausted and your legs complain, there’s always a renewed energy when feet and hands meet rock. 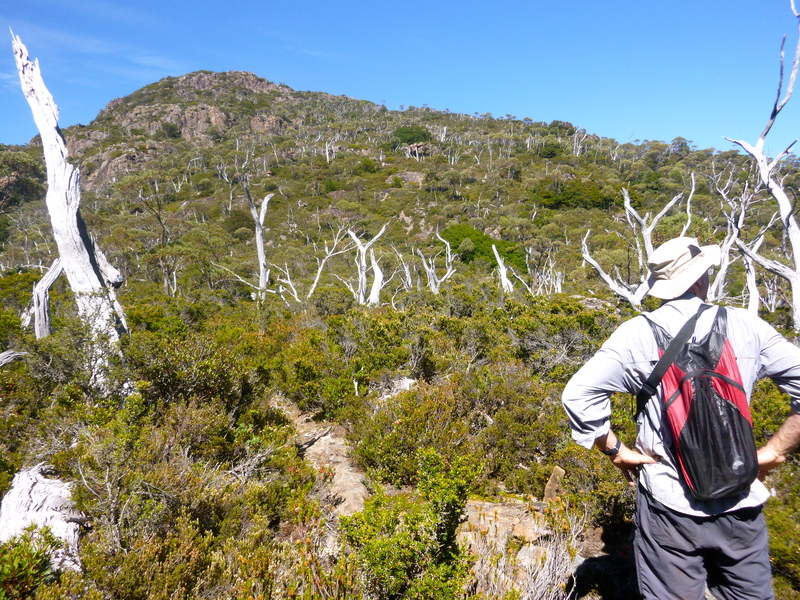 And so we made our way up, confused at first, then amused by what the Abels describes as a grassy gully, which to us seemed a little bit grassy, a little bit gullyish, and a lot bouldery (and some rather big towards the top). That wasn’t an issue at all really, except that it wasn’t quite what we were expecting based on the information we had. No matter, we continued on, climbed up over a lip, and discovered the perfect camp site by a tarn. A short break to cool down (yes, by submerging the tops of our heads, in the fashion of bowing to Mecca) and then we decided we’d better find the high point somewhere on the rather flat looking top. GPS’s are sometimes most handy! 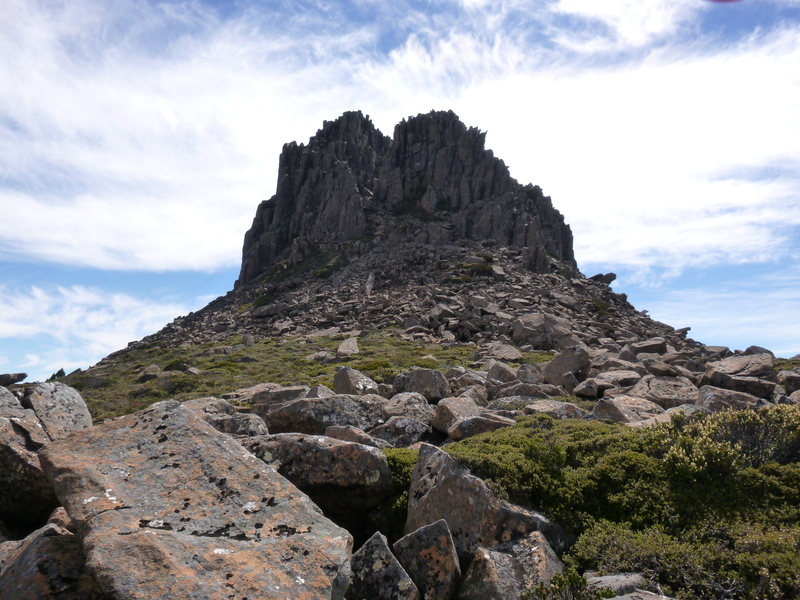 We find the cairn, perched on what turns out to be a wide column of dolerite with narrow drops around it. Paddy’s Nut looks very much smaller from here, and our attention is drawn towards Achilles and Achilles Heel.. Perrins Bluff still hides behind part of Thetis, with only the rise before it visible. 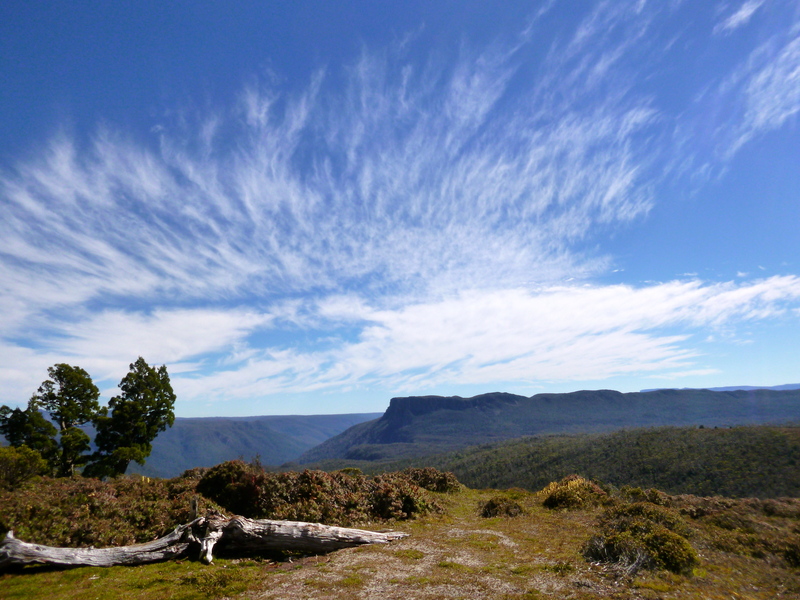 The mountains further south also receive due attention, but slightly less so, as they aren’t being visited this trip. Having made contact with the others to find they had an early start and are already at Leonards Tarn, we push on, heading across the short distance on top, and what a lovely and unexpected top it is! We found the grass that should have gone with our gully (well I suppose it did.. we just turned off to make a bee line to the summit before we got to the really grassy section), and we admired the spot briefly, before dropping over the edge. 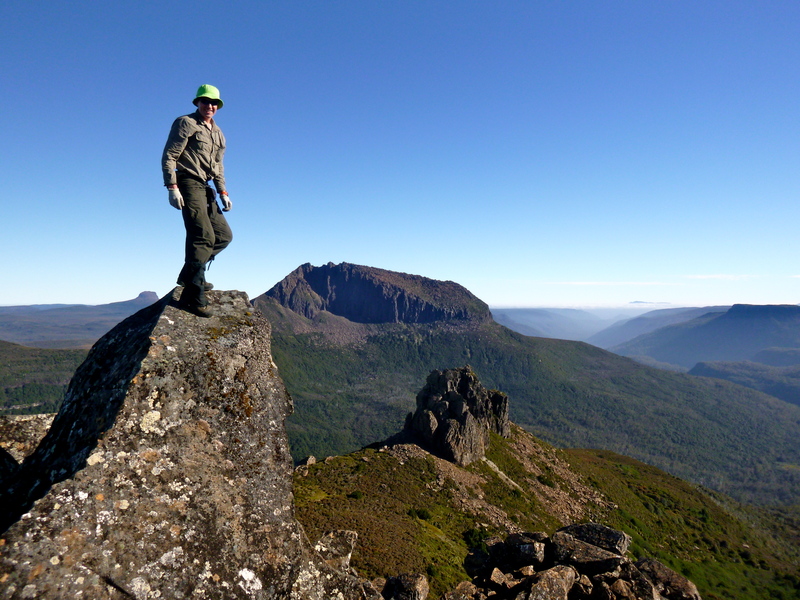 Standing on the edge I had my first view of Perrins Bluff :D! It’s always a bit of a rush to set eyes on what is perceived to be the biggest or furthermost mountain of a trip, especially when it’s been hiding. We headed down, straight down, grateful for the GPS route we’d been given which meant we didn’t have to waste time testing routes to see if they’d eventuate or if we’d have to turn back because we were heading right over a cliff. A touch of sidling as we neared the bottom of the scree, then a brief period of light scrub and we found ourselves on the saddle between Thetis and Achilles, and decided on lunch in the shade of a deciduous beech, alongside lots of little beech shoots, a short distance from Leonards Tarn. Here we received a few text messages from Murph, a tad confusing and all over the place due to poor reception. We eventually figured that the plan to camp between Achilles and Perrins had been scratched, and they’d dropped packs somewhere near Leonards Tarn, and in another change of plan were on their way to Perrins, instead of saving it for the next day. 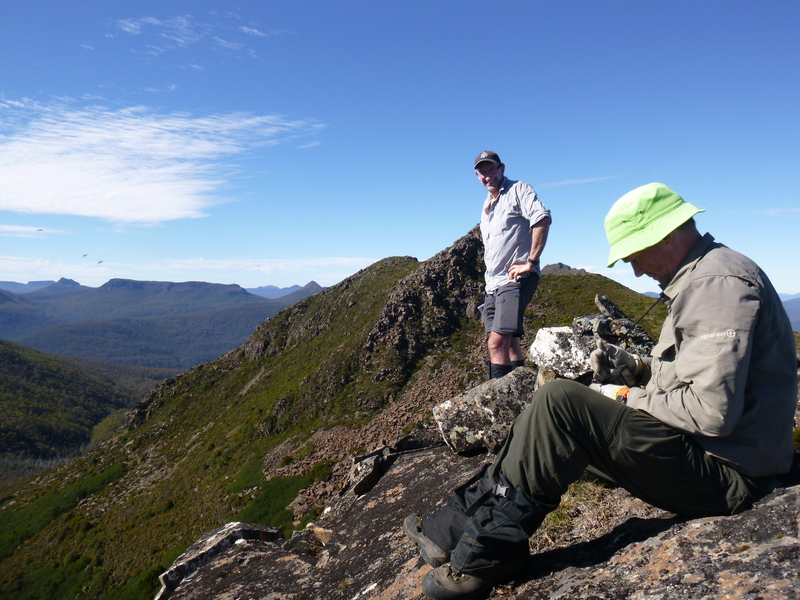 So in response, as we munched on food, we discussed also switching our plan to summit Achilles that day and Perrins the next, going instead for Perrins first too. It was decided, and so we left our big packs behind (I was rather grateful for this) and started up and around the side of Achilles. 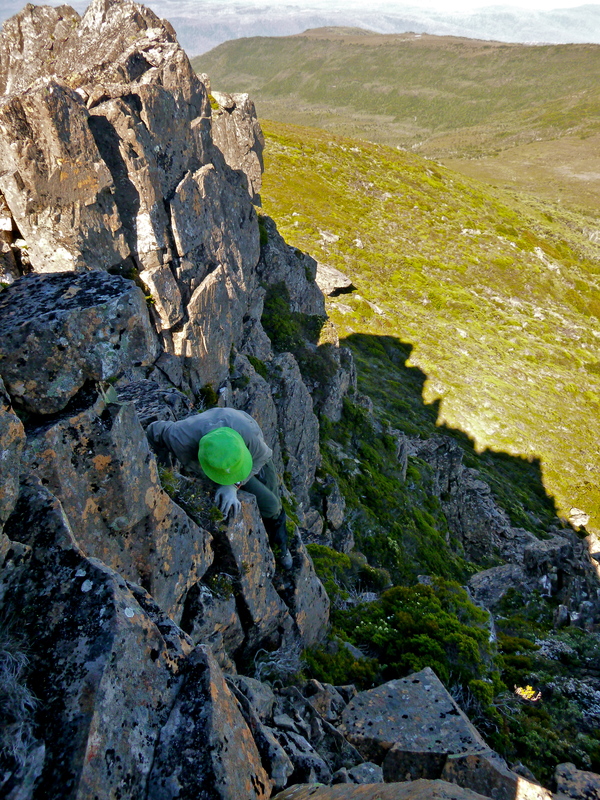 We followed rough pads where they eventuated, but otherwise found our own easy way over light alpine scrub and rock. As we sidled round the base this turned into shaley scree fields, which often threatened to shift under your feet. But they were passed quickly, and after a glance up the chute to Achilles that the Abels recommends going up for the ascent (we didn’t go this way, and reports have it that it’s rather loose and care must be taken not to send rocks flying down on anyone below you) we were onto yet more gardens. 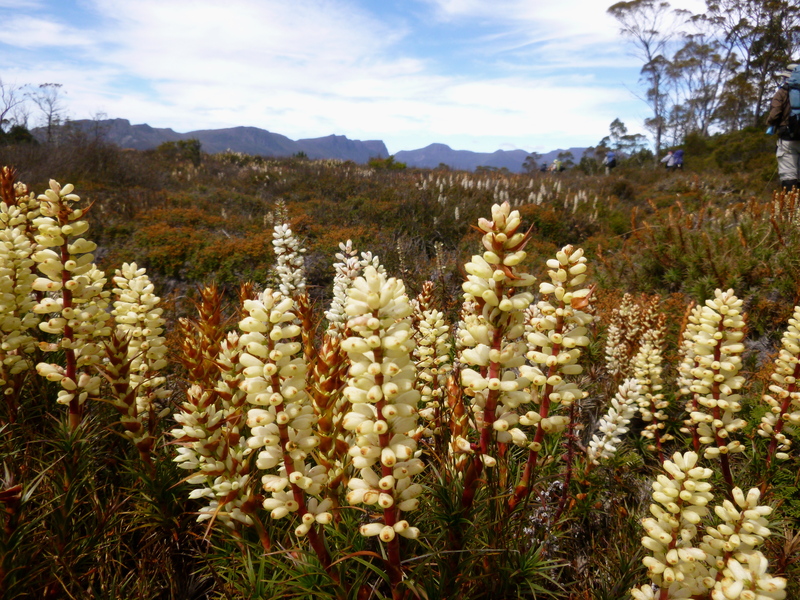 Beautiful green grass, manicured perfectly by nature’s own forces, a variety of flowers, and other alpine shrubs.. just a delight to walk amongst. 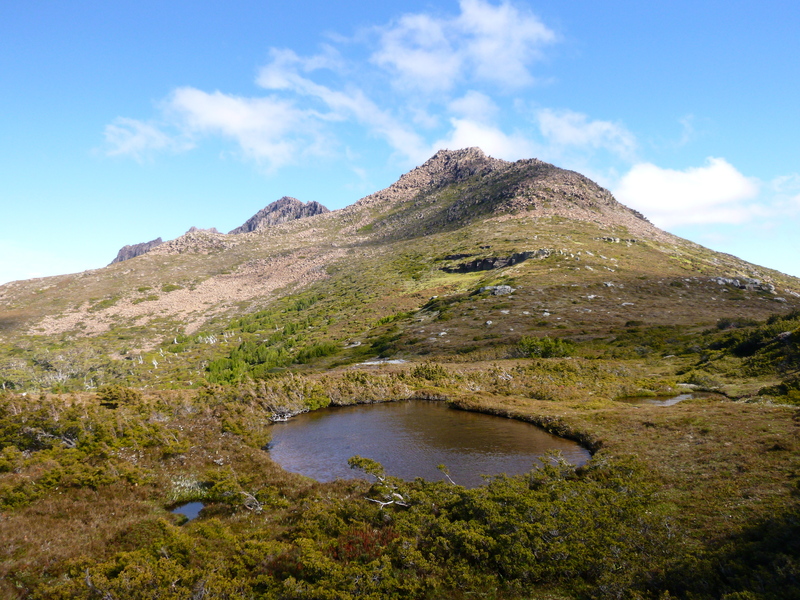 This took us to the tarns on the saddle between Achilles and Perrins (nice camping it would seem, if a tad exposed), and after a brief break to top up water, we found a pad and headed up towards the major bump before Perrins (which obscures Perrins from view at this point). The pad made for quite easy going amongst the scrub, so long as you took care to stay on it. We deviated by mistake in one spot, following cairns down to a small soak, and then having to scrub bash a short distance to get to clearer ground. The route continued to sidle around the western side of the bump/ridge, and we stayed on generally speaking unmarked, but quite decent and plentiful, pads. 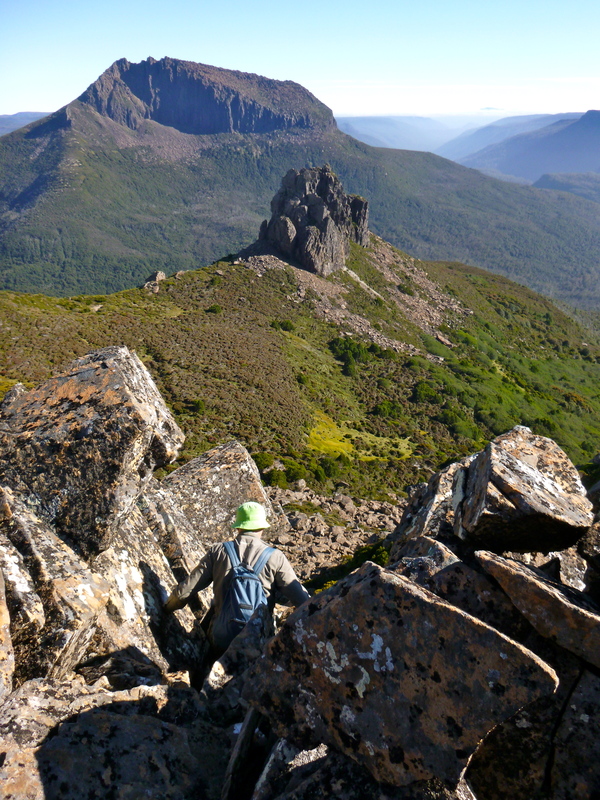 I’d been lazy, knowing I was in good hands, and had done no reading on the route up Perrins, and as we walked we spotted three figures on a gully that looked like it led to the summit. I assumed this was the generally accepted way up, but Graham seemed quite keen to head up to the ridge line and look over the other side. I hadn’t even considered the possibility of a route out that way, but I didn’t mind checking out the view over the other side of the ridge so over we went. Too early, but that was ok, a short while later we walked over again to have a look and lo and behold, one of the guys from our group pops up a few metres away! Hello!! Refuelled, it’s time to climb that mountain! It couldn’t have been more perfect timing, and they tell us the easiest way is to cross over the ridge and approach from the eastern side. 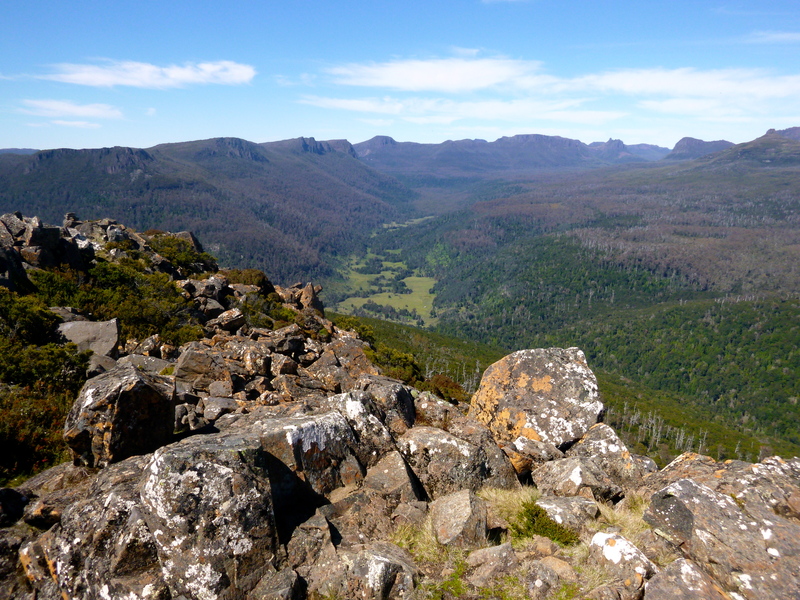 We’re only a couple of hundred metres from the summit, so we’ve made good time. Awesome! They’re heading back and a few will climb Achilles on the way down, with plans to summit Thetis the following morning. Great news, means we’ll have time to summit Achilles and Achilles Heel the next morning too, without having to rush to fit it in that evening. We part ways, and walk the last few minutes to the summit. The summit is such that when you pop up, you’re pretty much on the high point, and we were surprised to find three guys there, just about to leave. They’d been the three we’d spotted going up the gully, and we talked to them about the way we’d come up. They were considering walking out over Ossa and Graham chatted to them for a bit while I busied myself taking photos and enjoying the view. After taking photos for one another, they departed, and we were left to enjoy another top of the world moment. 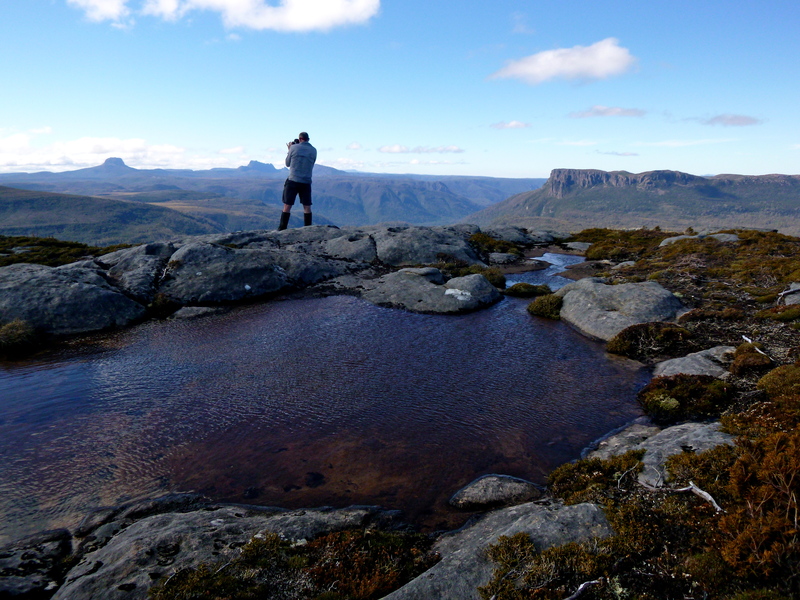 We had some time, so a phone call home to my awesome mother while taking in the mountains and trying to dry out my one wet foot (unsuspecting bog hole) was how I chose to spend most of it. I could have sat there for quite a long time just enjoying, but Graham was more sensible, and his suggestion to keep moving was the right one. 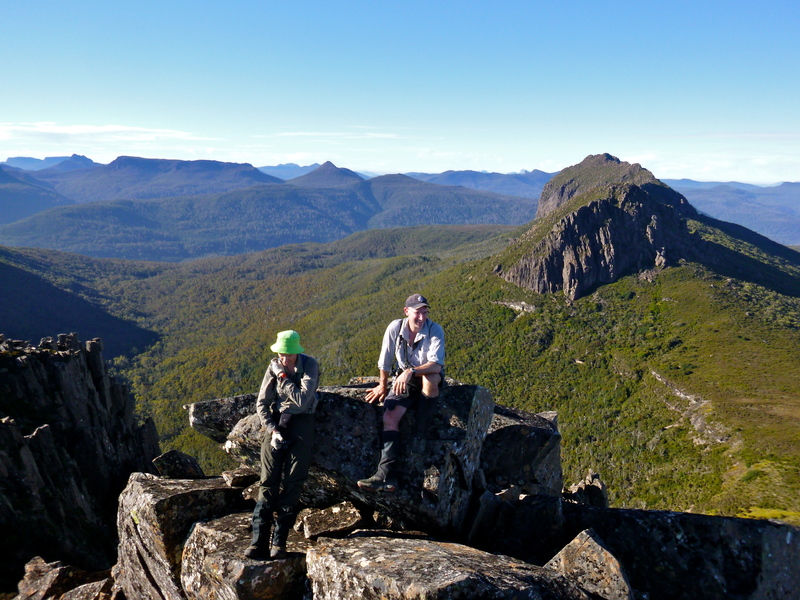 We had a largely scrub free walk back (you always find the best route coming back), and caught up to the three guys whom we’d met on top back at the saddle (where they ended up camping). A face and arm wash in one of the tarns was definitely in order. In fact, I was sorely tempted to take a dip, and would have had there been no one else around.. instead I just got to be envious of Graham’s back shower – shirt off, bend over, hat full of water poured over back, prompting almost non-human noise expressing the automatic reflex of shock then joy at the deliciously cold water.. very envious!! Back through the gardens, starting to get a tad tired by this stage, and grateful for a rest when we catch up to Murph on some of the scree. We sit a while with him, then move on at our own pace, shadows lengthening before us as the sun casts pale, but increasingly golden rays across the sky. Back at camp and I’m feeling exhausted, probably a cumulative effect from the previous days walking and working. Tent up, dinner, teeth, a bit of a look at sunset colours on mountains and silver tree skeletons, but only a little look, then straight to BED.. another night’s good sleep, as always, better than at home in my own bed. David was the designated rooster, and had a wake up call out at 5.30 the next morning. I was glad to be walking and sharing a tent with Graham, because it gave me the perfect excuse not to be up early again (without tarnishing my reputation for early starts :p!). So while a group of four headed off early to climb Thetis, we took our time getting ready, making Rohan wait patiently (which he did, true to form, remarkably politely) because the three of us were off to climb Achilles (Graham and Rohan had already climbed it on previous trips, but I hadn’t) and Achilles Heel (not worth any points for peak baggers, but Graham was interested, so why not, and I’m so glad I did!!). We were finally ready to go shortly after 7.30, and with our direct ascent (lots of fun, and quite easy really) were on top in 40 minutes. 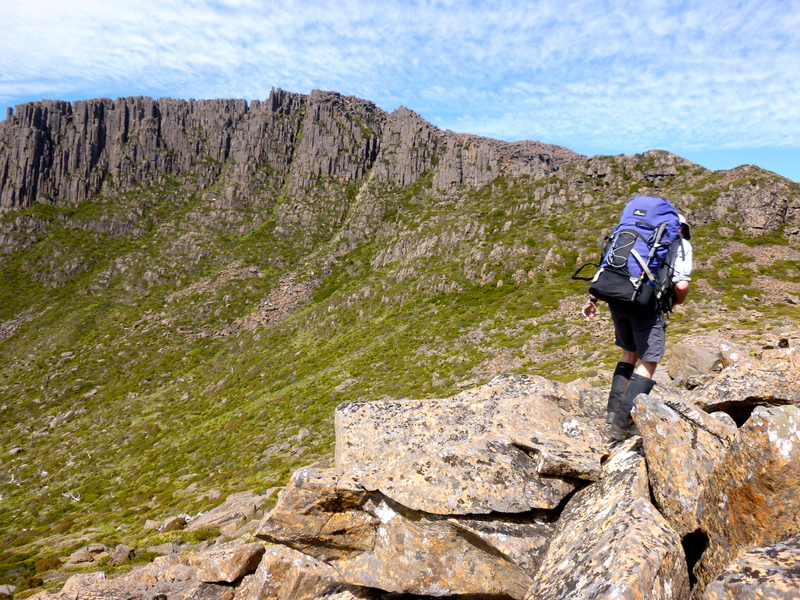 A few metres from the summit Graham, who had been leading, waved me forward to take the honours. So off I scrambled, straight up, without a thought. And there I was, standing on the sharp edge of the dolerite boulder that stood proud of all others around it. It was only when it came to get down I realised it wasn’t a summit all people would climb to the top of, but an awkward shuffle back down with a little unease had my feet back on rock flat enough to be trusted. More smiles, photos, chatter, and a discussion about our plan of attack on the heel. And hang on, what’s that moving over on Thetis? People! Rohan takes a photo and sure enough, they’re our guys.. we wave :). 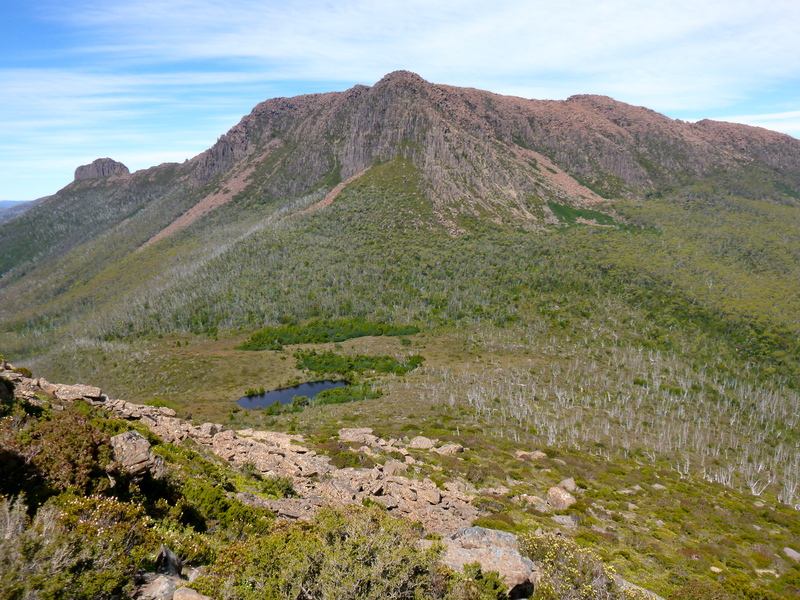 We’d already decided that the eastern side of Achilles Heel, which could be seen from camp, didn’t look good, so we decided on an approach round the western side, in the hope that we’d find a gully we could climb. All we had to go off was one line from I think a Chapman book that said it was worth a climb.. and Murph’s slightly concerning ‘have you got a rope?’ when we’d told him of our plans earlier! The sense of adventure just made it all the more exciting and I was quivering inside :D!! Onwards towards Achilles’ Heel.. owww excited!! But first, Rohan changed his mind and decided he’d better stand on the summit again, so he scrambled up the ramp provided by the rock, with ease. A quick photo, and back down. Graham decides on a different approach, and drops down, heads round the back, and pulls himself up from the opposite, overhanging side. He was probably the only one tall enough to do this, I certainly couldn’t have reached! To add to the fun, he has us all in stitches as he dangles his legs out behind him (sorry, no photo, he asked me not to, but it is a fun photo, you’ll just have to use your imagination)! The fun over, we turn to the task at hand, getting off. It’s easy enough, and we follow a gully to the right down onto the ridge between Achilles and his heel. It’s easy open walking, an obvious pad, and we walk past more gardens. Then we’re at the foot of the heel and all perspective goes. We just have the immediate to take clues from, and guess at a possible way up. We pass one possibility, not feeling it was good enough. Then there was a decent looking gully up, and it looked like others had used it before.. so up we go. Short and sharp enough, but with no really tricky moves and we’re on top… of.. the big toe, not the heel.. just over there, almost close enough to touch (ok, throw a stone at) lies the slightly higher point, complete with cairn.. bugger! 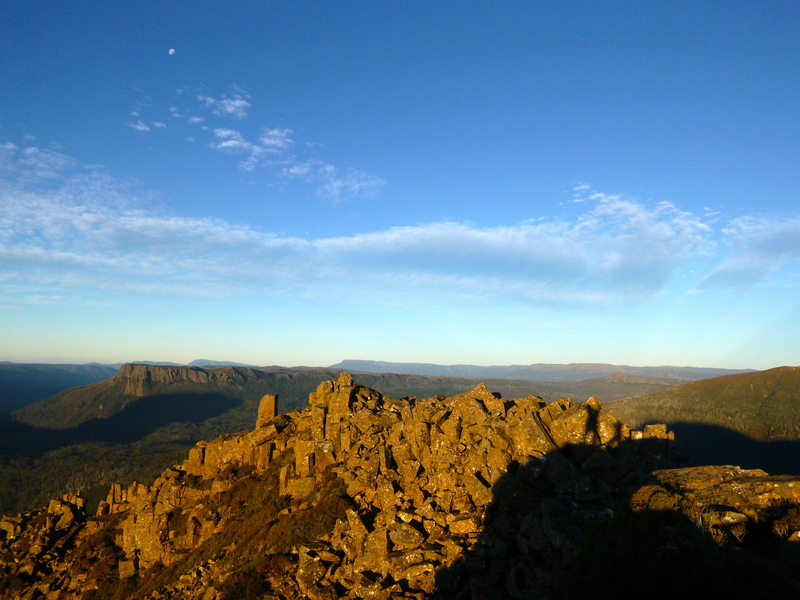 And as if on cue, a currawong flies up, and perches on a rock between us and the summit. We ask him for any tips on a better route, but he snobs us off, and hops out of sight. Ok fine.. a few photos, and down we go, wondering how far down we’d have to drop, and how far round, then back up we’d have to climb. It turned out to be shorter than expected, and after pondering one not so nice looking climb for a moment, we take the next decent gully. This one is much more climby, and I loved it. Graham expressed concern at one point (he’s in the lead, sensible, because I know I’d go up just about anything, safe or unsafe), but we’re almost there, and something maked him continue on anyway, testing each hand and foot hold. Then he’s up the hairy bit, and disappears over the top. I’m shortly behind, and know the top can’t be too far off. Rohan’s a bit further back, so I pause to check he’s over the tough stuff fine. A whoop of delight comes from behind me, and it’s clear Graham’s got to the top! Rohan’s up, and we head over to see what all the fuss is about. 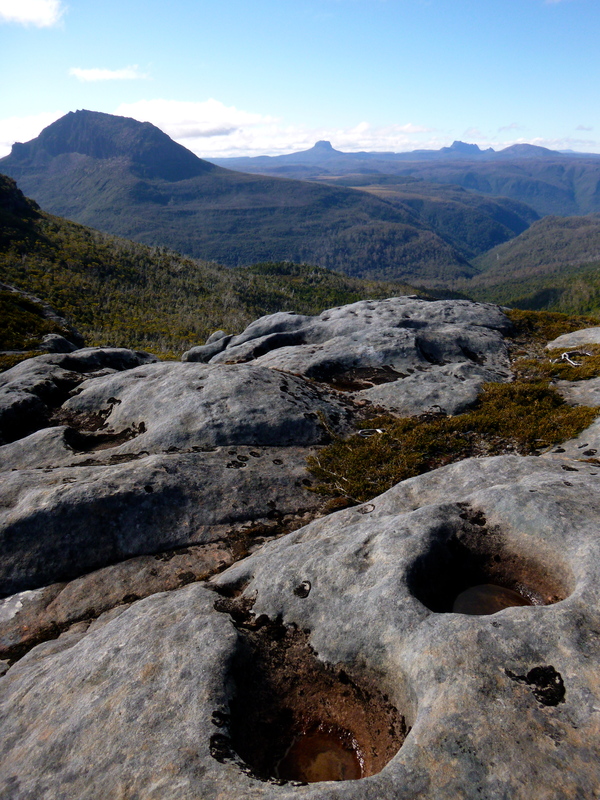 It’s a lovely little sloping summit, with an old mossy cairn on top, and we exchange smiles and congratulations. One of the guys lets out a yell, and I follow with a two fingered whistle. To my surprise a yell comes back up at us from Leonards tarn, where Murph was minding the tents. The guys yell back in delight. I was just ecstatic, my whole body charged with adrenaline from the climb, the summit and the place we were in. A perfect moment. 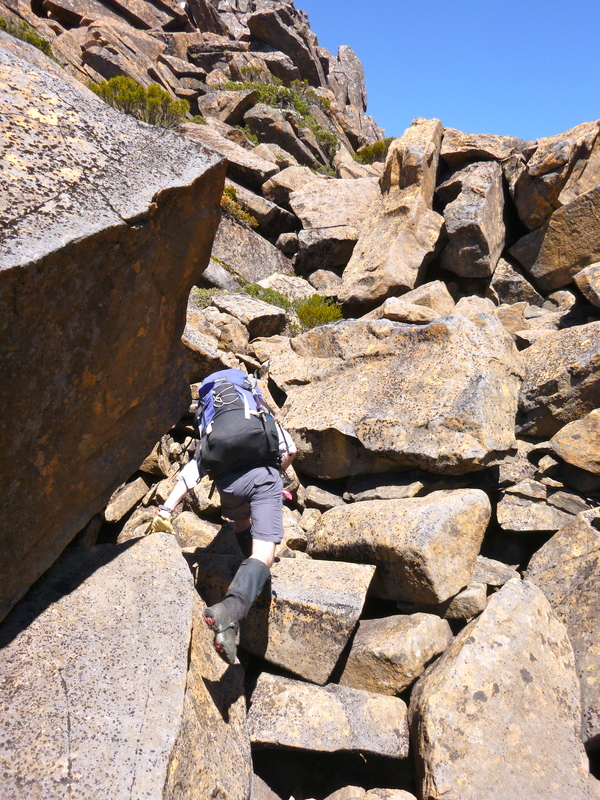 Heading back.. and this wasn’t the slightly trickier bit either! 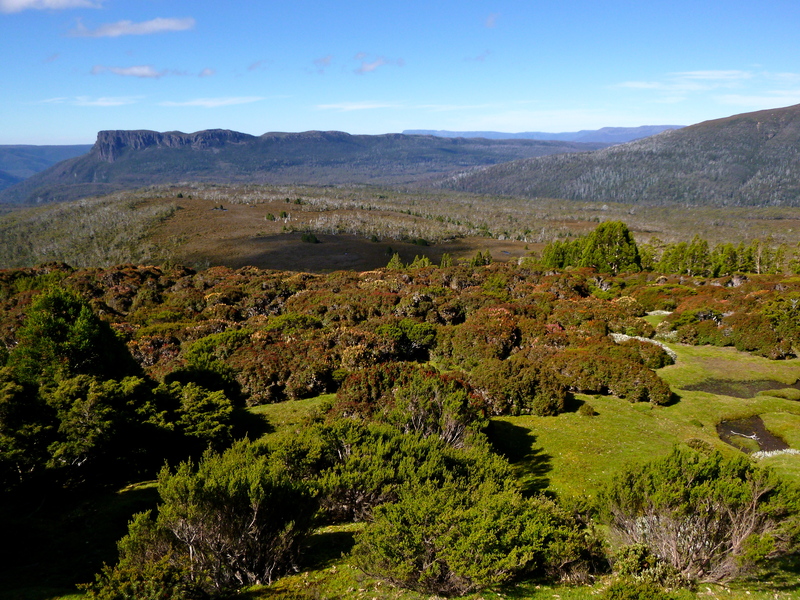 But we did have to get back, we were due to walk out to Frog Flats then New Pelion hut, and we would do well not to keep the others waiting. So down we headed, taking care on the first part of the descent, then moving quite well across the ridge, sidling through gardens, light scrub and scree around Achilles, and back down to the tents, in only 35 minutes. The other group who’d been up Thetis were back, and starting to pack, and after agreeing on a time of 11am, we also got down to business. I detested putting on over pants in such heat, but I’d heard stories of how terrible this scrub was, and I figured the knees would like a bit of protection. As it was, Murph led us down a fantastic lead, and the scrub was really quite light, with no actual pushing through anything, more just manoeuvring around. 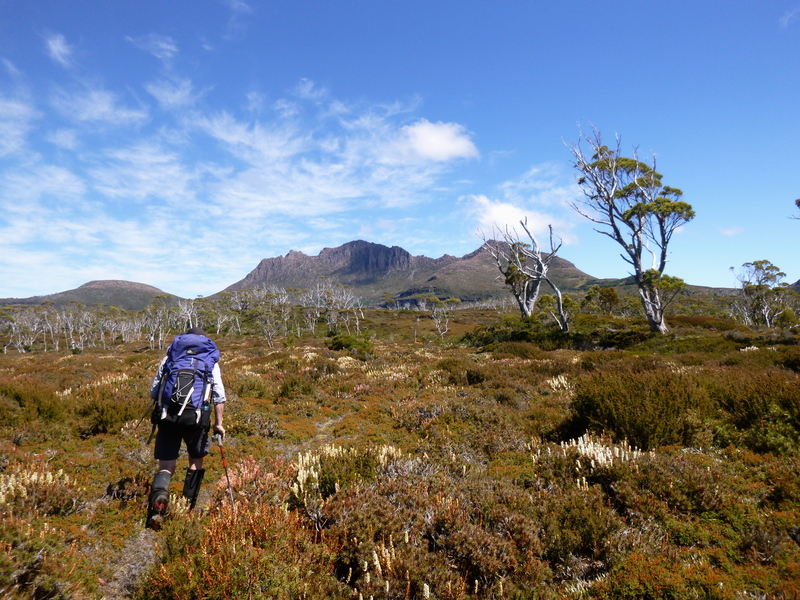 The pace was steady with welcome stops at different creeks, and we were down to Frog Flats by 4.40. 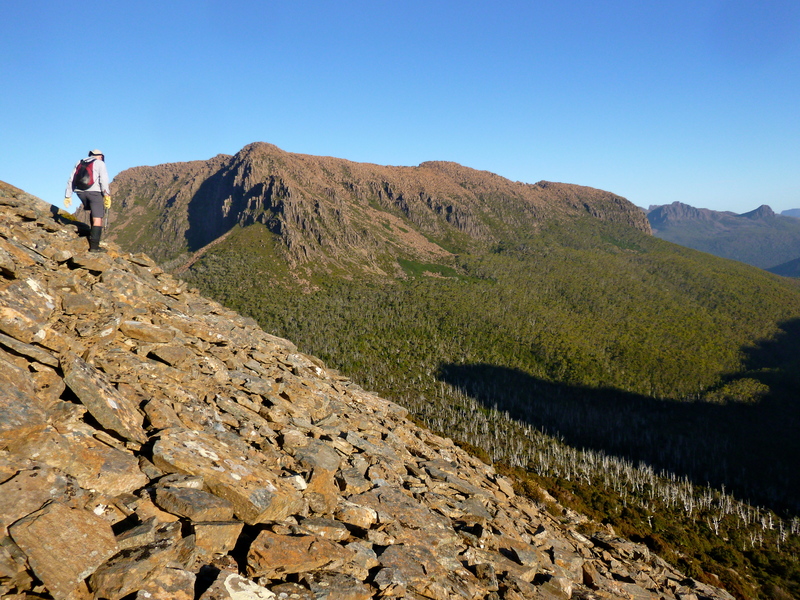 Here we walked at our own pace to New Pelion Hut. Graham and I were eager to get in a wash, and we walked on ahead. There was little conversation, and I know I was off with my thoughts when I wasn’t trying too hard to keep up with his long and seemingly never tired stride. We ran into a track worker who was doing an amazing job by himself of laying down new boardwalk over the bog. A complete stranger, he was surprisingly perceptive, and we had an amusing and delightful little chat, before leaving him to continue his work (thankfully in the shade by this time). A short while later and we were at New Pelion Hut, selecting a tent site, then deciding the planned wash in the river was in order before pitching the tent (for me, because I knew if I cooled down there was no way I was getting into cold water). The river is almost designed perfectly for a bathe. A steep drop, which flattens out at the river’s edge, then a vertical bank of just over a metre, which provides enough privacy should anyone else have the same thought and venture down (they didn’t). The way the bank twisted and turned meant we even had our own ‘cubicles’. And so we freshened up, enjoying the sensation of removing sweat, scrub and sunscreen, though flinching at the bite of each splash of cold water on skin. Clean body, clean clothes, ahhhh.. not much beats that on a bush walk! The others are back by this time, and a few follow suit and wash in the river. We pitch our tent, cook dinner, and spend the evening chatting . As the day begins to draw to an end, Graham and I do dishes, then head out to the platform to watch the sun set on Oakleigh. But Pelion West must be in the way at this time of the year, and the light only hits part of Oakleigh’s flank. So we sprawl across the platform and chat about all sorts of things. It’s a nice time to sit and reflect on how special the trip has been and how beautiful this part of the world is.. a fitting end to the day. As we walk back towards the tent a bandicoot scuttles across the path, pauses, bounces a bit further, pause again, bounce, pause.. seeming inquisitive enough not to race off immediately, then he changes direction and bounces back across the path, deciding he has somewhere else to be, and disappears, but with no real urgency. His presence and behaviour have us smiling. Plans for the next day are mixed again. Louise, from Launceston, leaves early, the rest of the group a little later, and Graham and I, half an hour behind them. They’re all heading straight out, but Graham hasn’t climbed Pillinger, and I haven’t had views from the top, so we’re up for a slight detour. We reckon we can fit it in, and why not, it’s nice to make the last day about something other than just walking out! 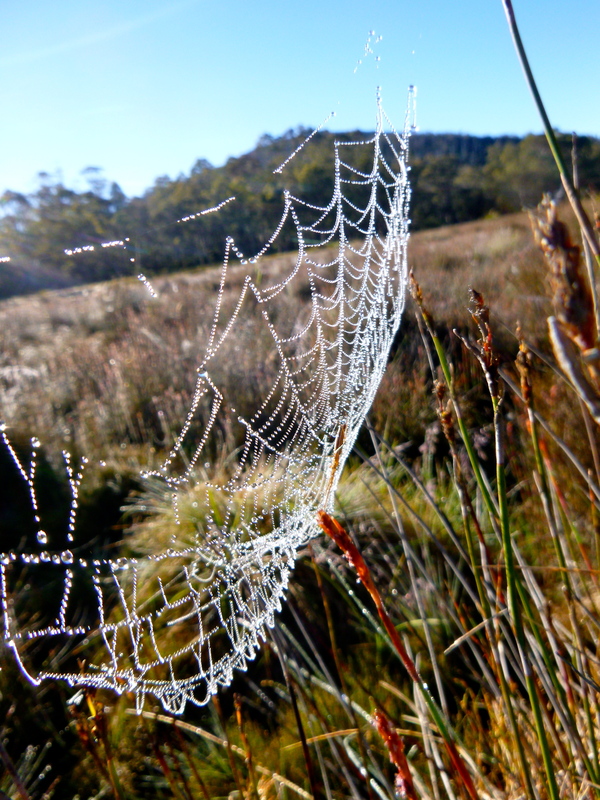 We move fast enough, pausing to marvel at the beauty as sun hits a field of grass glittering with dew, dozens of spider webs spun between stalks, like intricate pearl necklaces sparkling in the morning light. It’s impossible to photograph them into the sun, sadly, so we just had to enjoy them then and there. On we went.. making note of the possible path down to the plane wreck.. then finally running into the group at a river crossing. We stop to snack and fill water, while they move on. Then we’re up again, and find them waiting at our turn off to Pillinger. We say our good byes and thank yous, then wind our way along the pad. And looking towards Lee’s Paddocks.. yet to be explored! 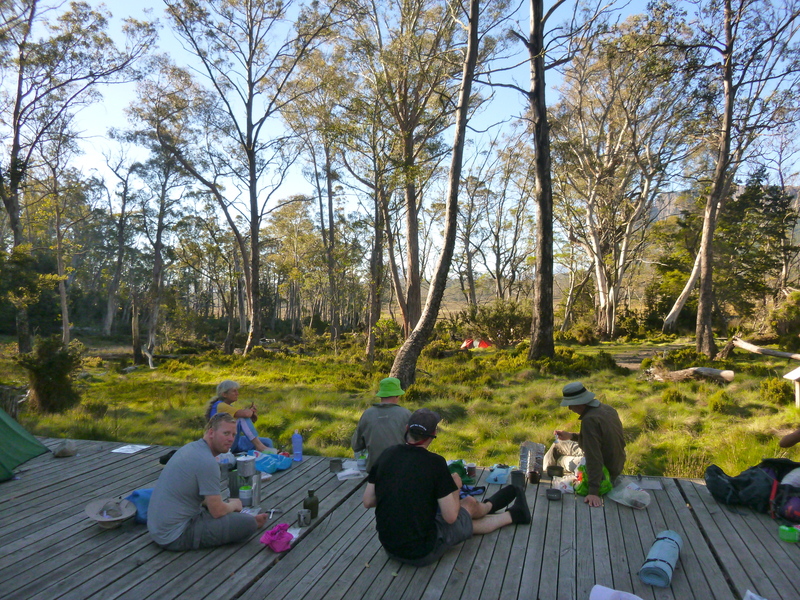 It isn’t long to the Pillinger turn off, and we drop packs in the shade. 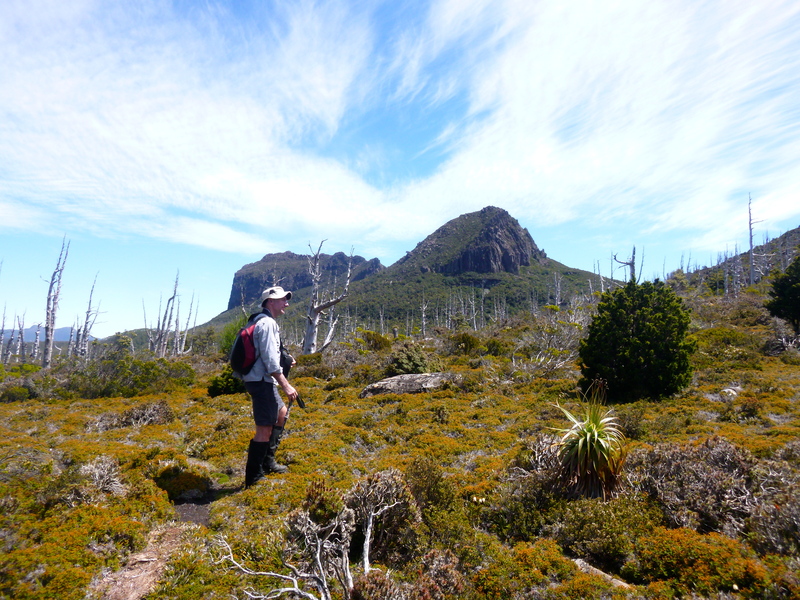 Up we go, easily following the marked (tapes and cairns) track up. It’s hot, and my shirt is soaked, and my legs are complaining, but it’s short enough, and we’re up in 55 mins. 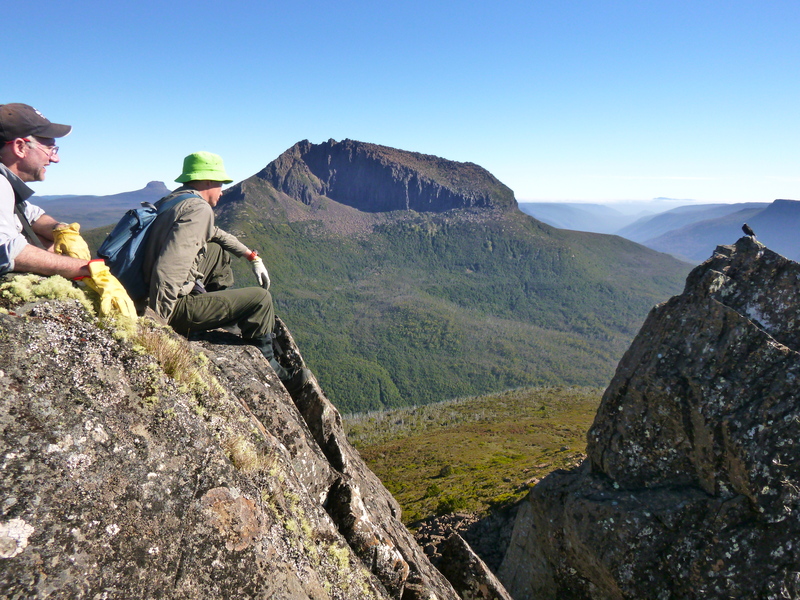 I get my views, Graham gets his summit (and views) and we both get to look back at where we’d been (everything but Perrins Bluff was visible). The mountains seemed so distant already. It was a lovely way to finish the walk, and again, I found myself not really wanting to come home.. but a slightly more easy paced 90 minutes saw us back at the car, changed, and with the air conditioning on. An ice cream at the honey shop was a must, then a long drive home, slightly slower on the sections of melted bitumen (crazy, the car had the temperature at 41)! 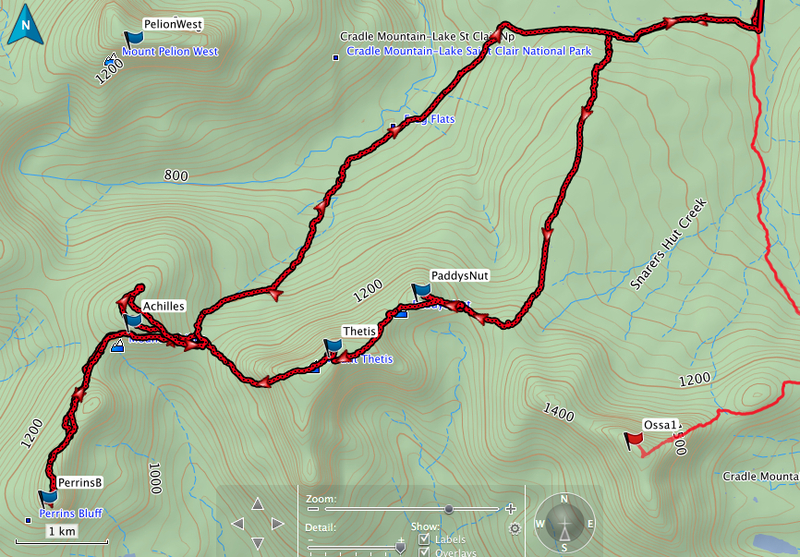 61.6km according to my GPS (though the batteries died twice so parts are missing), and 3183m ascent.. Please forgive any typos, I haven’t reread this (way past my bed time!!) and I’m pretty tired..